A mother has rejected a prize for school attendance given to one of her sons because she does not believe children should be "rewarded for luck". Writer Rachel Wright, of Southend, Essex, said 100% attendance awards "demonise the weak". 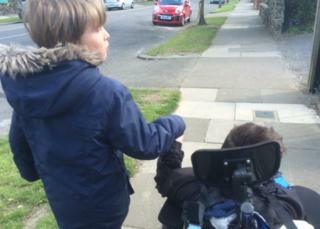 Mrs Wright said she is particularly attuned to this issue because one of her three sons has cerebral palsy. "You get rewarded for hard work. They don't give you a reward if you have brown hair," she added. She has written a blog about her concerns which has been viewed on Facebook by more than two-and-half million people, she said. Her three children are Sam, 11, who has cerebral palsy, Jonah, 10, who received the 100% attendance award, and two-year-old Ethan. She said she told Jonah: "You will not get a reward for not being sick." Mrs Wright, who has written a book about her experiences bringing up a child with cerebral palsy called The Skies I'm Under, said there are children at the school with asthma and she does not think they should be penalised for not having a 100% attendance. In her blog she said: "In this family you are not shamed for ill health, vulnerability or weakness. In this house you are not encouraged to spread germs when you are not well. In this house we look after ourselves and the weakest amongst us." She said said she did not want to "victimise" the school as this is a common practice, but she wanted to spark a debate about her concerns. "I know the school is trying to prevent absences, but I don't think this is the way to do it," she added. James Courtenay, executive councillor for children and learning at education authority Southend Council, a unitary council, said: "With school attendance so crucial to a child's education and the clear link to attainment it is easy to see why schools reward attendance in this way. "However I can also understand Mrs Wright's view, who makes some interesting and eloquent points in her blog. "It is a difficult situation for schools but ultimately it is a matter for individual schools to decide on." The Department for Education said it would not comment on awards for attendance as this would be a school decision.